In August, Brooklyn College began issuing electronic student IDs as an alternative to the traditional, plastic card. 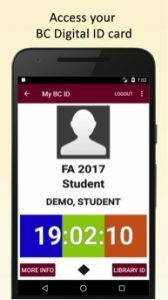 Thanks to the college’s IT department, students can now access the electronic, visual recreation of their ID via the college’s BC Navigator app. According to The Kingsman, digital IDs were created in order to improve the college’s security. Brooklyn College is a commuter campus, but as with any other institution, campus security is a big priority. The electronic IDs contain an image of the student, their full name, the current term, their library ID, and a code that security guards can use for verification purposes. Future plans for the electronic student IDs include more robust verification and event ticketing functionality. For now, though, the digital IDs can only be used at security checkpoints to get onto the college itself. Students cannot yet use their digital ID to get into events that require proof of a student ID card. While the digital IDs have made mandatory campus security checkpoints easier for students, they aren’t expected to replace the school’s physical campus cards anytime soon. The digital ID relies on network access in order to function, so in the event that the app isn’t working, it’s important that students have a physical campus card with them. According to The Excelsior, Brooklyn College’s student newspaper, some students claim that app takes too long to load. However, the college has a website for BC Navigator which details the features of the app, including the digital ID. If students have trouble using the digital, they can refer to the page for possible solutions.